PORTLAND, Ore. — Millions of dollars worth of deals are being made at the Cannabis Collaborative Conference at the Portland Expo Center this week. 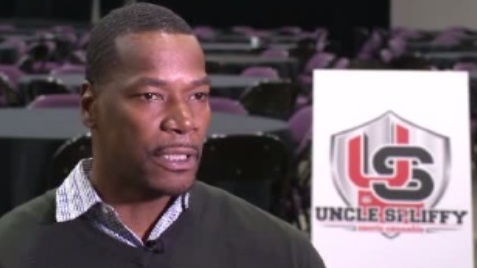 None other than Cliff Robinson, the former Portland Trail Blazer, is the keynote speaker. Robinson is in the marijuana business now with his Uncle Spliffy Sports Cannabis, starting with hemp-based clothes and products online only. Once he gets a recreational retail license, he’ll be opening up in Portland to sell marijuana itself. There is no actual pot at this pot convention. It’s strictly equipment, ideas and Robinson’s very big name that’s getting a lot of attention. Followed all week by cameras from ESPN, VICE News and Dope magazine, Robinson is flipping the script on marijuana. “Being an athlete, and to be standing behind and being out in front of it is definitely controversial, but at the same time I think it’s a conversation that needs to continue to be had,” Robinson said. As a Blazer in the 1990s, Robinson nicknamed himself “Uncle Cliffy,” so the new Uncle Spliffy spin wasn’t hard to come up with. He says marijuana would be a great alternative for athletes to get off prescription pain meds. “I don’t think it’s a big conversation right now, but as more states continue to come online and more athletes continue to voice their opinion in a positive way, the conversation will get bigger and bigger,” Robinson said. Robinson thinks eventually sports leagues might allow it, and he’s getting a lot of support from players. It’s because the stigma is dissipating fast. Besides Robinson, other businesses are also sharing their ideas. High 5 Tours is converting a shuttle bus into a bright yellow, legal mobile smoker’s lounge to take a party group wherever they want. Right now, they have a Stoner Bingo tour and a Portland munchies tour. “We take the tour around to the food pods, all the great food trucks we have, take them to RocketFizz, Cartlandia and VooDoo donuts and make that the tour,” Jake Cipolla said. MRX Labs from Tigard makes and sells high tech extraction machines to make marijuana vapor oil. Two sons, their mom and step dad combined their backgrounds to form the business. “I never in a million years thought I would be in the cannabis business with my mom. It’s really neat and exciting,” said co-owner Jonah Barber. The convention is bigger than ever. “It’s taken a lot of very smart people and legitimized them and now that wealth of knowledge they’ve kept behind closed doors is out for everyone to see,” Robinson said. The convention goes through Thursday, when Robinson will give his keynote address.